Disclaimer: Being a sequel, there may be spoilers for the first book, but NOT for this one. Also, any quotes may be changed from ARC to publication. First line: Until I crawled beneath the designated dumpster behind the abandoned Linens-N-Things and felt the brush of rough canvas against my fingertips, I really wasn't sure that the emergency bag would be there, as my father had promised. Middle books are difficult. Trilogies are super popular, but authors still have a hard time trying to get from Point A to Point C because they have to cross Point B without falling to the death. I'm sure there's a lot of planning, groaning, headaches, and coffee involved when writing book two. For the most part, I think Kade succeeded in this one. She avoided the alligators and all that jazz. Mostly, what I loved about this book was that at times it felt like Kade knew me. She seemed to know the littlest things that, if fixed, would make a book so much better for me. Below is proof. Exhibit A: No rehashing. If you're like me and forgot to reread the first book, keep in mind that you may feel a little lost at first. Some people demand recaps in sequels and depending on the book, I might too. Most of the time, however, I wish authors wouldn't recap so much. I already read all that, come onnn, you know? Well, the characters rehashed some, of course, making references to what her father and GTX did and what happened with Jenna and Rachel from the first book. That's to be expected since everyone makes references to the past. But we weren't overwhelmed with boring recaps of the previous book, basically being given a summary to what happened in The Rules. "But what if I forgot what happened?" You can 1. Reread The Rules, 2. Ask someone, or 3. Just read The Hunt and everything will come back to you. I remembered some of what happened, but since it was a year ago since I read The Rules, I did forget a couple specifics. Once I started reading, though, my memory was restored. Exhibit B: Characters addressing their tropes. I've come to realize that in fiction, tropes will be made. Characteristics, dialogue, and plot points are all aspects of the story that seem to make a little visit into Tropeland. This book wasn't swimming in Lake Tropey, but a couple elements seemed to veer into that area. What separated this one from other books I've read is that the characters realized it and tried to fix it. I repeat, they addressed the tropes. "This isn't your problem," she said finally. "I can't ask you to take any more risks." "Here's the thing: you didn't actually ask me anything. You just left." Ariane and Zane found themselves thinking or acting a certain way sometimes and addressed it. The trope of pushing away someone you care about so they won't get hurt? He called her out on it. Because I always want to know the negative before I jump into something, I thought it would be only fair to give a warning of the negatives I came across. One was the middle book syndrome. "But I thought you said that she succeeded with this sequel?" Oh, she did. At the same time, this drifted into the Land of Middle Book Bridges. You know what I'm talking about. When the pacing is a little wonky in parts and it feels like you hurried to eat the pre-meal salad so you could get to the MEAT or the breadsticks before the pasta although Olive Garden breadsticks can hold their own. Characters on the run are a hit or miss for me, depending on a variety of things. 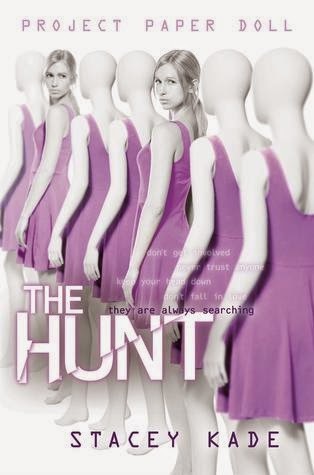 With The Hunt, it wasn't a miss, but I didn't feel as satisfied as I did at the end of the first book. With that said, once I finished it, I instantly wanted the third book. SO WHERE IS MY COPY? Verdict: Not as good as the first book, but still very worth reading.